Nice looking card. Amex has always taken care of me when frauded. I like this card. My only gripe is a lot of my large purchases aren't cash back eligible. If I spend almost 5 grand on something I'm expecting my rewards balance to go up at least 50 bucks (1% on all other purchases). Only to be disappointed when it only goes up 15 bucks or so. 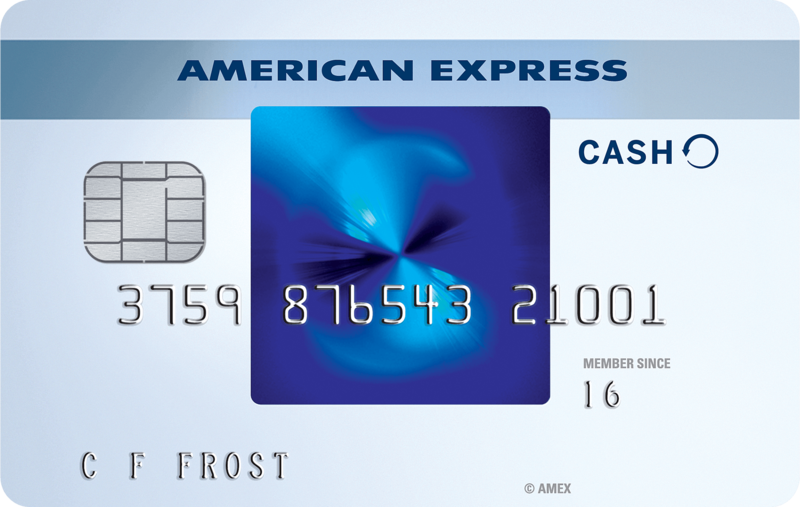 Amex is always a month behind on the cash back. I applied less than a year ago and instantly received a CL of $8000. Just remember they pull from Experian and not TU or EQ so Creditkarma isn't exactly a reliable source for approval odds. I docked off two stars because of two reasons: First, even though I worked hard over the years to build up my credit score to ~ 760's - 780's across TU, EX, and EQ and got approved with a 777 EX score, I never received the $150 sign-up bonus at all. I had a retcon with a representative twice over it and was told, yes, I did receive the bonus. It's an error and they'll have it fixed. It's already almost a year and still nothing so not a fan of the bait and switch strategy with this offer! I even applied for Chase Freedom Ultimate the next month after American Express and received my $150 immediately. Secondly the perks and bonuses offered isn't all that grand unless I heavily charge with this card. Overall it's an okay credit card from my experience. 15 mos. no interest plus instant approval with a good starting CL was an excellent start but everything right after is just lukewarm. Learn from my experience and take it into consideration. 'm writing this review, not because I'm unhappy with the card, I am unhappy with the Anex at this point. They put restrictions on all of my cards. I have 6 cards with American Express, two business and 4 personal cards. Now I can't use any of my cards because they decided to do a financial review on my accounts. Now I have to wait until November 11 For that to be over. I must contact the IRS to order my tax return transcript and mail it to American Express so that they can lock at my income. Just don't think it's fair to treat your customers this way. So just wanted to let you guys know what I have experienced and I'm just thinking what's next surprise. Suspend all of my accounts, I say no reason at all, never late payment, never carry balance. I'm sure they found something on your credit report or you incorrectly stated your income for them to suspend your accounts lol. May be unrelated to your cards, but they feel that they are at risk. Not American Express's problem. when you have more than thirty thousand CL in all your combined credit cards with them they do random audits even when your in good standing with them and never missed a payment. With American Express having more than 30k puts you in that pile of Audits or they did a credit check on you a soft pull and seen u had to much availble credit extended to you. With everyone and CPN numbers they are worried. Just stop. There is never no reason to have 6 cards. I mean your just over extended yourself and caused this to yourself. I have a everyday card and a blue everyday card for 8 years now total CL 20k. I know better not to have over 30k. They increased me once and I called and asked for a decrease. I didnt want those problems like u.
I respect your reply and will consider this. Really don't want to have to deal with this again. Thanks. Applied for this card with all 3 credits scores around 740s and got approved for $8,000. I honestly didnt need that much but I applied cause there’s no annual fee, cash back is 1-3% depending on what you purchase, which I didn’t realize till after I got the card I thought it would just be on my overall purchase but still pretty good. Best advice pay way more than minimum payment or just buy what you know you can pay in full at the end of month and you’ll be fine!!! Check out the card deals. Got 10% off my next 2 cell phone bills. Get 10% off your insurance bill. I just booked a cruise and got $150 back. Last month, got an additional 10% off groceries for 6 weeks. New ones pop up about every month. I worked for them almost 20 years. I was laid off 11 monts from retirement and a coworker had 58 days. If they will do this to their own employees think of what they will do to you and you’re just a credit card number. I had the card for 5 years. What they did to me is credit my account with the intro bonus when I earned it, gave me reward dollars after accumulating $25, and gave me over $250 additional dollars on deals. Gave me quick access to customer service too. Not sure what happens when you are an employee, but being a customer is great! Amex MUST be paying "Rsmy123" to go in an post such stupid comments to these reviews. Additionally, it appears a LOT of the reviews that are 5 stars and say only "GREAT" are bogus === again, probably Amex is paying trolls to post good reviews in an attempt to keep their score artificially higher. Mostly good. Had my credit limit lowered randomly coincidentally after I declined an offer to "upgrade" to the 95 dollar annual fee version of the card. Credit card issuers look at your credit many times throughout the year. They made an adjustment to lower their risk because of that and other factors. Do not apply for this card just because it's nice to have. You need a Experian FICO of at least 700 to be treated fairly with a decent limit or a pre approval from them with a offer. If not you will get a low credit limit that wont benefit you if you're credit savvy and pay your bill each month on time. The name dont mean nothing if it doesn't benefit you! I have the card for 9 months. Fico score was 680. I have not had a long credit history and got a low limit. And that's okay. After 60 Days I got a raise. Couple days ago Amex even raised my limit by itself. I pay the card off 2 times a month and do not use it for balance transfers. Because I have none. I always look that I have a good credit utilization ratio less than 30% and a good score. For anyone complaining here, look in the mirror. Blame yourself and stop blaming others for your crap. The way you act it comes back to you. I use the card to give me freedom. I do not use it for debts. The advice I was giving has nothing to do with crap you idiot it has to do with a person's expectations so keep your misinformed comments to yourself! I thought this card was exactly what I needed for balance transfers and I was pleased with my credit limit, only to find out the balance transfer limit is $7500 no matter what. I feel like I was tricked into applying for a card that is useless to me. Customer service is always good with Amex. The $150 bonus however, I had to follow up twice for it and am still waiting for it. I have had the card since October 2017 and its May now. During the 2nd follow up in April, they said that it would take another 6-8 weeks for the $150 bonus to appear on my credit card. I did mention to them that this is the longest time I have to wait for the bonus that they have offered.